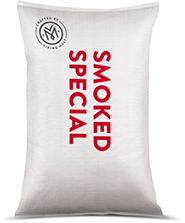 Smoked malts are produced from 2 row spring malting barley, null lox variety. The flavours of these malts are as with pilsner malt with rather strong smoky flavor depending on type of wood used for smoking. We can use apple, beech, cherry, sweet cherry and pear wood delivered from ecological, clean areas. In the brewing Smoked Malts can be considered as pilsner malt with a special aroma as Smoked Malts flavor and taste profile is not too overwhelming. Smoked Malts can be also used in bakeries as a spice. We use apple, beech, cherry, sweet cherry and pear wood delivered from ecological, clean areas.